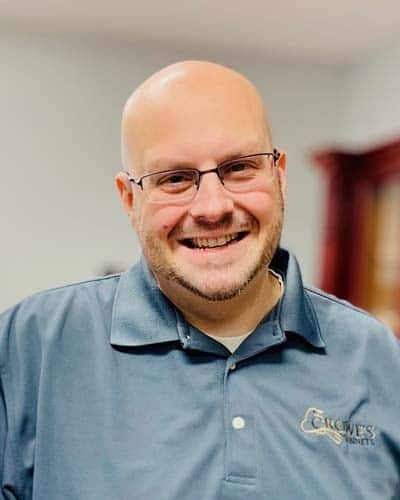 Rob Rivello – Crowes Cabinets, Inc.
No matter what, from day one on the job, it is clear that the customer always comes first at Crowe’s Cabinets. Whatever the customer wants we are able to deliver on expectations. I believe what makes us the number one choice is our willingness to collaborate, and to ensure quality for the customer. There’s a concerted effort throughout the organization that Crowe’s Cabinets will get projects done on time, and that we will meet, and deliver on, high expectations. Without sacrificing on quality and craftmanship I ensure that each project is built to spec and tailored to meet the needs of our clients. There are no short cuts. The overall attitude is a can-do, get-it-done mentality. I am very proud that during my time here I have seen an increase in the number of returning and ongoing clients, plus work with Youngstown-area contractors has doubled. When I am away from the office I enjoy hanging with my family, golf, and taking the family on vacation to Ocean City’s famed Boardwalk.